Flights, hotels, museums, shows... save some $$ to visit New York and enjoy your trip! If you find any other promotion, share it with me and I'll add it to the list. The "3 Day Sightseeing Pass & NYC Helicopter Tour" includes the 3-Day Sightseeing Pass with 72-hour access to double-decker bus tours and a helicopter tour with stunning aerial views of the Manhattan skyline and iconic NYC landmarks! Adult tickets are only $413 and if you use the code SAVE10, you can save an extra 10%! So you are basically getting it for $371 -- which is $102 is savings! Pay less for the Sightseeing Flex pass and the Sightseeing Day Pass! Purchase your FlexPass or Day Pass with up to 20% off! To know more about SightSeeing Flex Pass, click here. To know more about SightSeeing Day Pass, click here. 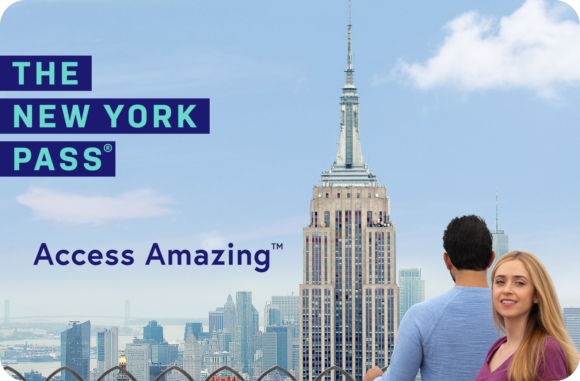 You can get 10% off on your New York Explorer Pass, no code is needed. Compare the different offers, you can buy it now and use it later since the Explorer Pass only expires starting the first day of use. Purchase now your FreeStyle Pass New York and save an extra 40 dollars! You can also enter the code "Save10" on your final purchase to get an additional 10% off, try the code "NYC15" for 15% off (give it a try, I don't know if this code is still working EDIT: Still works on 2019-01-07). Purchase now your New York Pass and save up to 30% depending on the pass you choose. Compare the different offers, you can buy it now and use it later since the New York Pass only expires starting the first day of use. You can get 10% off on a helicopter tour!!! While checking out you have to enter the following code: "FLY10"
The code "Save10" will give 10% on all your purchase! You can have 10% off on bus tours with the coupon code "Welbus17"
You can rent a bike with Central Park Sightseeing and get -50% off. You just have to enter the code: "50OFF"
Go Airlink is a shuttle company helping you to transfer from one of the NYC airports to Manhattan! - Save 10% with code "GOSHARED" you must enter in the "GroupID/Discount Code" field. 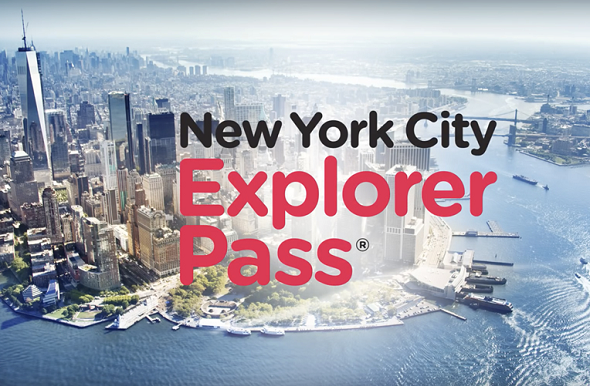 You can get up to 25% off on your New York Explorer Pass until September 16. You can save 39% on a All Around Town Tour + Empre State Building package purchased on Citysights NY !!! You can get 10% off on a bus tour purchased on Citysights NY !!! You just have to enter "WELBUS17" to get 10% off! You have until January 31 to get 15% off on the FreeStyle Pass New York !!! 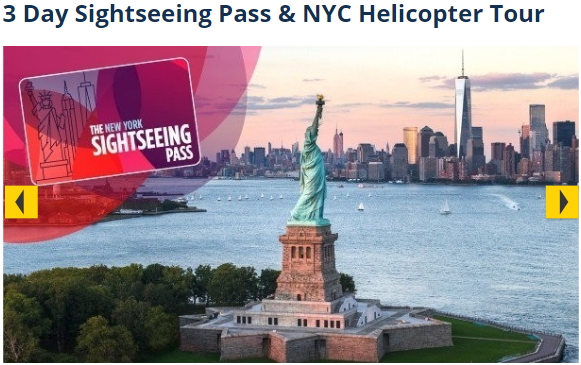 - FreeStyle Pass New York: -15% : code "FS15"
You have until December 31 to get 15% off on all bus tours, and to get 10% off on helicopter tours !!! - Bus: -15% code "WINTER15"
- Helicopter: -10% code "FLY10"
Book a Broadway show with Citysights NY and enter the Coupon Code NYCSHOW while checking out and you will receive $15 off! For another attraction or museum, enter the code MYNYC to get 10% off. You have till April 30 to get 15% off on bus tours, and till April 17 to get 10% off on helicopter tours !!! (You can buy till Sunday and make the helicpter tour later). - Bus : -15% : code "SPRING15"
- Helicopter: -10% : code "ADROLL10"
You can save $15 on your All Around Tour with Citysights NY! The offer ends on March 8. Purchase now your New York Pass and save $30 or $40 depending on the pass you choose. The offer ends on January 10. Clik here for more informationThe offer ends on January 7. 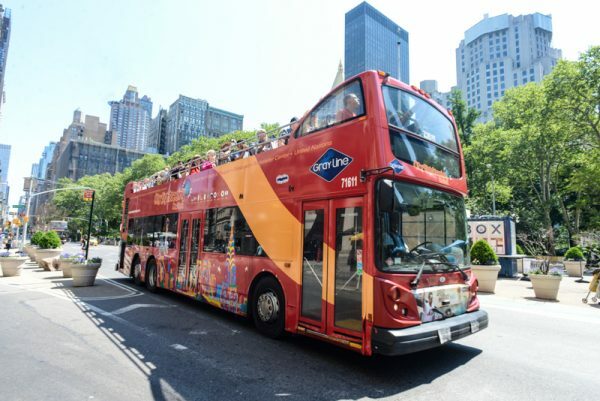 CITY SIGHTSEEING NY offers up to 15% on its fireworks cruise !!!! Enter the following coupon while booking: NYENYC (offer ends on December 31). CITYSIGHTS NY offers $10 off on its fireworks cruise!! Purchase now your New York Pass and receive up to 15% on selected Pass. Clik here for more informationThe offer ends on Sunday January the 3rd. 2 responses to the post : " Special promotions and savings to visit New York "
There's no special dates on your dates but don't worry, you will always find good deals in stores like TJ Maxx, Burlington Coat Factory, Century 21... Or you can go to Jersey Gardens or Woodbury Commons outlets!